during miami fashion week, skin and beauty care company, nivea was around to promote their product ‘good-bye cellulite’. at an event to celebrate the new collection of swimwear by designer shay todd, nivea had exclusive sofas present as a bit of ad placement to promote their skincare product. 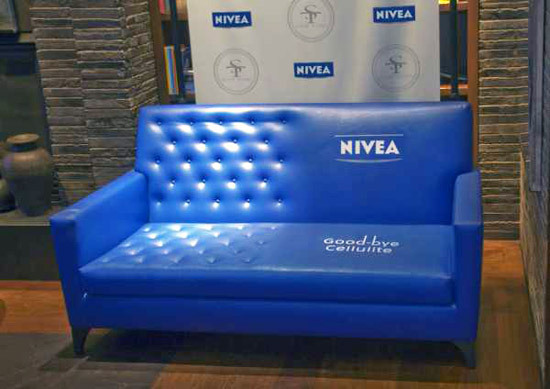 half of each sofa was tufted, meant to depict bumpy ‘cellulite’, while the other half was smooth, seemingly meant to show what happens when you use nivea’s ‘goodbye cellulite’ lotion. of course, the upholstery was done in nivea’s signature blue. the agency responsible was TBWA / chiat / day new york, with the seating built by dune. Im Allgemeinen ist es beim Oberbegriff nivea’s ‘good-bye cellulite’ sofa installation wie ich es sehe immer sehr essenziell, dass die vielen Posts genauestens kontrolliert werden, damit alles genau stimmt. Dies scheint mir hier auf der Seite 100%ig normal zu sein. Deshalb lese ich in diesem Blog oftmals sehr gerne.